"Memo" to James Comey: You Could Have a Big Problem! Michael Flynn provided the Vice President with a misleading summary of a phone conversation he had with the Russian Ambassador to the United States. Flynn’s deception was then evident, when what he had said about the call was compared to a recorded version that was in the possession of U.S. intelligence services. Flynn’s misstatements to the Vice President cost him his job. He has since come under an expanding criminal investigation by the FBI and reportedly is the Target of a federal grand jury. Mr. Comey, following his testimony this week, could very well face a similar situation. On May 12, President Trump famously tweeted that meetings at the White House may be recorded. The tweet was labeled by the Media as a veiled threat by the president, aimed at chilling Mr. Comey from leaking self-serving, inaccurate statements in retaliation for President Trump firing him. Leakers, seemly from FBI executive management and in collusion with Mr. Comey, then revealed Mr. Comey had authored memos documenting all his meetings with the president. The press immediately seized on the memos, teasing their possible contents as hidden treasure troves of ammunition to stir-up controversy against the president. However, a crucial observation was missed by Mr. Comey's FBI leakers and the media pundits, but immediately recognized by experienced investigators: if White House tapes do exist, their contents could be compared to Mr. Comey’s alleged memos about those meetings, and to his testimony to Congress. If the tapes contradict the spin in Mr. Comey's memos or testimony, then the White House tapes would be reliable evidence to launch investigations of false statements or perjury by Mr. Comey, very much like the intelligence agency tapes that originally had landed Mr. Flynn in hot water. So here's Mr. Comey’s big problem: he writes his spin in FBI official Memos about White House meetings, but only writes memos about contacts with one carefully chosen elected official. Then, later his memos are compared to unexpected White House audio recordings of those meetings that turn-up. If his spin is proven to be inaccurate, misleading or untruthful, for instance it leaves out pertinent things Mr. Comey or the president said, it’s a big, big problem for him. Mr. Comey needs to look no further than Mr. Flynn’s predicament to learn about the extreme perils of unexpected recordings turning-up to compare to what you have previously claimed during official government inquires. Having spun self-serving memos, omitting material parts of conversations, and placing them into the FBI official records, well, that could be considered a crime. To testify in front of Congress, under oath, adopting the false narrative in your secretly kept, misleading memos, well, that could be considered perjury. Those circumstances would be worthy of a grand jury investigation. And don't make the amateur mistake of thinking recordings might somehow back-up a written account of a meeting. They never do, there are always points of difference. The FBI itself finally recognized this after seventy years of clinging to policy that allowed agents to write summaries of post-arrest statements given by subjects. Now, by strict policy, the FBI must make every effort to audio record an arrested subject's statement. They are not permitted to take notes and then write a report later in such an important matter as a post-arrest statement. Clear principles of fairness exist for that policy having been forced on the FBI. Obviously, principles of fairness that Mr. Comey chose not to apply to the president. Under what legal authority, do you Mr. Comey, get to personally pick-and-choose which elected officials to create one-sided official FBI files about”? "Isn't that what J. Edgar Hoover did? The practice of keeping a secret little book on other government officials, although isolated, is sometimes virulent among bureaucrats, especially at the FBI. We wonder if Mr. Comey wrote any Memos about his many meetings with President Obama, former CIA Director John Brennan, or White House officials like Susan Rice or even Lisa Monaco. Hopefully he will be questioned about that next week. Another question we hope Mr. Comey gets asked is, “if you didn’t write Memos for your scores of conversations with other elected officials, then under what legal authority, do you Mr. Comey, get to personally pick-and-choose which elected officials to create one-sided official FBI files about”? And maybe a follow-up: "Isn't that what J. Edgar Hoover did, Mr. Comey?" Comey provides a briefing to the president and White House officials on December 05, 2015. Did Comey produce a Memo of comments made by President Obama during this meeting? An important FBI policy to consider in relation to Mr. Comey’s memos, is the Attorney General’s Directive to DOJ agencies regarding communications their with the White House, codified as FBI policy in its Domestic Investigative Operational Guidelines (DIOG). Trying to justify during testimony next week his widespread, blanket memo writing about one specific White House Official, and not any other White House official, could be treacherous waters for Mr. Comey to navigate while under oath. The bureaucratic fable of “keeping-book”, which according to Mr. Comey’s leakers, he seems to have selectively aimed at the president, goes like this: if a bureaucrat quickly writes down their own spin on a meeting, and no one else attending writes anything, then what the spinner wrote magically becomes what happened, rather than what actually happened. This spin tactic is especially useful to bureaucrats wishing to later ambush meeting participants who become their enemies. Boy, that sure does sound familiar to Mr. Comey’s current situation. In my near three decades of FBI service, I’ve seen many versions of these lopsided, secret little books disguised as “Memos to the file”. One thing they all had in common: never once, did any of those Memos ever say anything bad about the spinner who wrote it! Mix-in a bit of pandering, playing to an audience that the spinner believes he will have at the time of future enemy ambush, and you have the eye-rolling, self-serving flavor of most of those Memos. One such fanciful FBI Memo immediately comes to mind where FBI agents and U.S. Secret Service agents faced-off against one another, hands on their holstered guns, threatening to pull them on each another at a major-league baseball game, all while a U.S. President was close-by. But, of course, that’s another story. 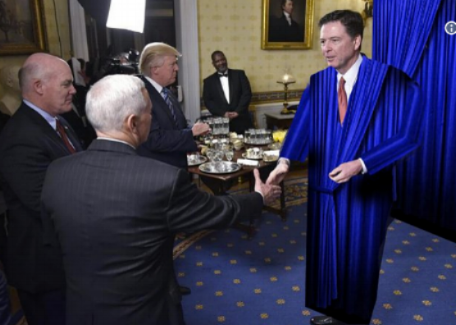 If White House tapes of Mr. Comey’s meetings do exist, and Mr. Comey has left out any significant details in his memos about those meetings, then, Mr. Comey may again find himself trying to locate another set of very tall curtains in which to hide.